The House Judiciary Committee on August 11 released interview transcripts of Karl Rove and Harriet Miers on the U.S. Attorney firings, as well as over 5,400 pages of e-mails on the subject from the Bush White House and Republican National Committee, according to a Judiciary Committee press release. The July 7 & 30 Rove interviews and exhibits are here, the Miers transcript and exhibits are here, the 11-part White House documents are here, and the 15-part RNC documents are here. An extensive list of documents from the DOJ and Monica Goodling, Q & A's of several former U.S. Attorneys, and Grand Jury indictments and charges are here. On Friday, August 14th, Congressman Bob-Filner (D-CA) and other prominent members of the community will participate in a border policy roundtable at the University of San Diego. The event will focus on binational and policy issues important to the San Diego area and will be held in the Joan B. Kroc Institute for Peace & Justice, Room A &B from 9:00 am – 11:00 am. For more information please contact Emily Lawrence at lawrence-09@sandiego.edu. We blogged in June about OpenRegs.com's user-friendly enhancements. Well, the Feds aren't taking it sitting down. "The eRulemaking Program has launched a significant upgrade to the Web site that provides one-stop, public access to information related to current and forthcoming regulations issued by the federal government. Enhancements to regulations.gov include improved search capabilities, new navigation tools, and easier access to areas for the public to provide comments on proposed regulations. The Environmental Protection Agency is the managing partner of the inter-agency eRulemaking Program, which operates regulations.gov." The 9th Circuit Court of Appeals struck down a Bush administration policy that attempted to exempt large swaths of land from the Clinton-era Roadless Area Conservation Rule. Click here to read the full decision. U.S. President Barack Obama announced last week that he had instructed Susan Rice, the U.S. Ambassador to the United Nations, to signthe U.N. Convention on the Rights of Persons with Disabilities. Parties to the Convention are required to promote, protect, and ensure the full enjoyment of human rights by persons with disabilities and ensure that they enjoy full equality under the law. The Disability Convention already has been signed by 140 nations and has been ratified by 60 nations. The Convention (and an Optional Protocol) entered into force in May 2008. Once signed, the Disability Convention must be submitted to the U.S. Senate where it must be ratified by a 2/3 vote. 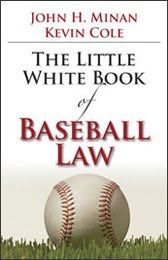 While browsing our new book truck, I came across the next book in the ABA series of “little books of.” This one is The Little White Book of Baseball Law [by our own Professor Jack Minan and Dean Kevin Cole]. Not only is it the season for America’s favorite past time, it’s also time to get inspired for research problems as the new academic year rapidly descends upon us. It's also just an enjoyable, short read. The book discusses cases (with citations provided) relating to new stadium construction, ownership of baseball memorabilia, injured spectators, media contracts, and even cases about rules of the game of baseball. The book is divided into innings as opposed to chapters—how appropriate. From the publisher, the book “is written in a short-story format with additional references to movies, songs, history, and other asides that will add to the reader's enjoyment.” An example is a reproduction of the indictment against Barry Bonds for steroid use, included to stress the point that the market value of baseball memorabilia is tied to the reputation of the player to whom the memorabilia is related.